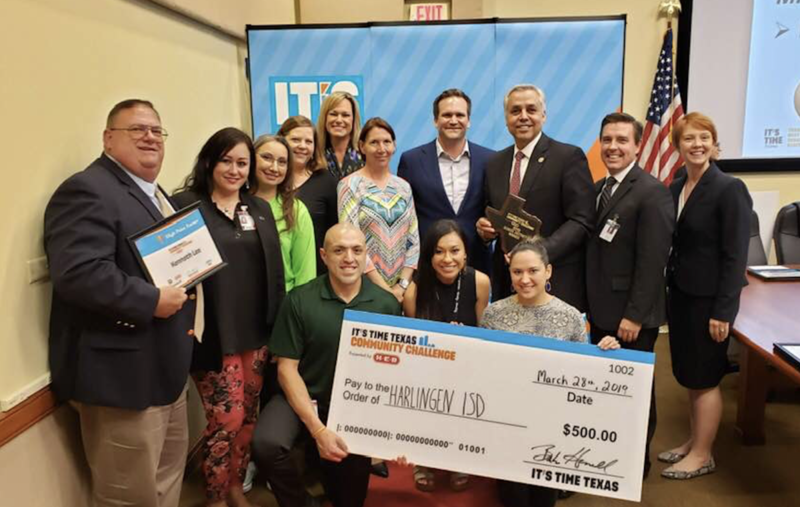 For the fourth year in a row, Harlingen CISD came in first among school districts its size in the It’s Time Texas Community Challenge. It’s Time Texas, a non-profit organization dedicated to encouraging healthy lifestyles, holds the challenge each year to encourage communities to get moving, eat healthy and consume water – all in an effort to combat obesity and obesity-related disease. The challenge includes school districts and cities from across the state. The city of Harlingen and Harlingen CISD both won the challenge in the friendly competition among similarly sized cities and school districts. Additionally, Harlingen CISD scored more points than any other school districts in the state, attaining a higher score than larger school districts. This year, the challenge resulted in participants losing 8,341 pounds cumulatively, according to the non-profit organization’s website. The challenge produced more than 12.6 million minutes of exercise. Harlingen CISD scored 3.6 million points by logging their healthy choices on the It’s Time Texas Community Challenge’s website. This year’s number is up from last year’s 1.5 million points. Participants in the challenge include school district students, staff as well as Harlingen CISD Superintendent Dr. Art Cavazos. The non-profit awarded a $500 grant to Harlingen CISD for its win.